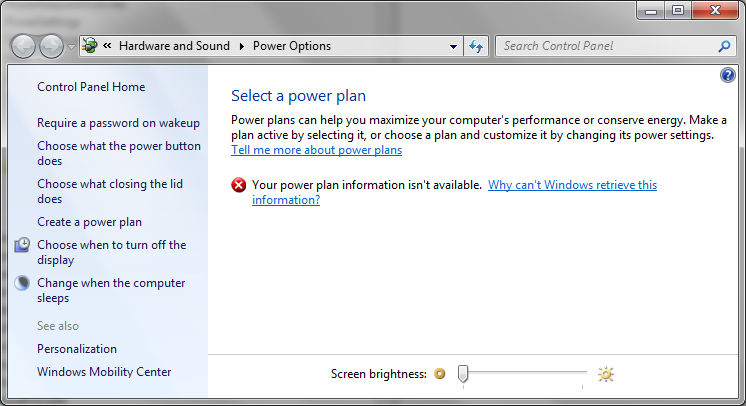 Due to corruption or some other reasons, Windows can loose track of your power plan. And the following screen appears saying "Your power plan information is not available". I believe the above command does the following steps as shown below. So in case the above command fails, follow the steps as shown below. If that doesnt work manually do the following. The registry stores the details of the power plans and power states of the various devices under various conditions. It is stored in the following location under registry. HKEY_LOCAL_MACHINE\SYSTEM\CurrentControlSet\Control\Power\User\PowerSchemes . 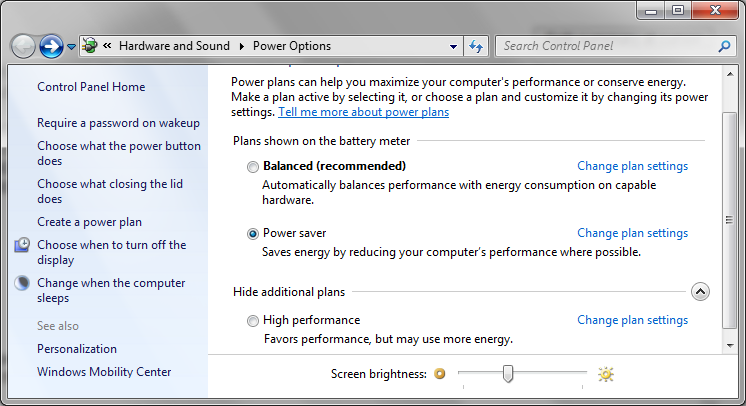 Windows use the former to display the power plan options in control panel. So if something is corrupted in the registry entry, you can restore it from the later registry entry. This can be easily achieved by exporting HKEY_LOCAL_MACHINE\SYSTEM\CurrentControlSet\Control\Power\User\Default\PowerSchemes to a .reg file, Search and replace all /Default/ with / and then import the same back into the registry. This is "Example" of how the reg would look like after exported. [HKEY_LOCAL_MACHINE\SYSTEM\CurrentControlSet\Control\Power\User\Default\PowerSchemes] "ActivePowerScheme"="381b4222-f694-41f0-9685-ff5bb260df2e" [HKEY_LOCAL_MACHINE\SYSTEM\CurrentControlSet\Control\Power\User\Default\PowerSchemes\381b4222-f694-41f0-9685-ff5bb260df2e] "Description"=hex(2):40,00,25,00,53,00,79,00,73,00,74,00,65,00,6d,00,52,00,6f,\ 00,6f,00,74,00,25,00,5c,00,73,00,79,00,73,00,74,00,65,00,6d,00,33,00,32,00,\ 5c,00,70,00,6f,00,77,00,72,00,70,00,72,00,6f,00,66,00,2e,00,64,00,6c,00,6c,\ 00,2c,00,2d,00,31,00,34,00,2c,00,41,00,75,00,74,00,6f,00,6d,00,61,00,74,00,\ 69,00,63,00,61,00,6c,00,6c,00,79,00,20,00,62,00,61,00,6c,00,61,00,6e,00,63,\ 00,65,00,73,00,20,00,70,00,65,00,72,00,66,00,6f,00,72,00,6d,00,61,00,6e,00,\ 63,00,65,00,20,00,77,00,69,00,74,00,68,00,20,00,65,00,6e,00,65,00,72,00,67,\ 00,79,00,20,00,63,00,6f,00,6e,00,73,00,75,00,6d,00,70,00,74,00,69,00,6f,00,\ 6e,00,20,00,6f,00,6e,00,20,00,63,00,61,00,70,00,61,00,62,00,6c,00,65,00,20,\ 00,68,00,61,00,72,00,64,00,77,00,61,00,72,00,65,00,2e,00,00,00 "FriendlyName"=hex(2):40,00,25,00,53,00,79,00,73,00,74,00,65,00,6d,00,52,00,6f,\ 00,6f,00,74,00,25,00,5c,00,73,00,79,00,73,00,74,00,65,00,6d,00,33,00,32,00,\ 5c,00,70,00,6f,00,77,00,72,00,70,00,72,00,6f,00,66,00,2e,00,64,00,6c,00,6c,\ 00,2c,00,2d,00,31,00,35,00,2c,00,42,00,61,00,6c,00,61,00,6e,00,63,00,65,00,\ 64,00,20,00,28,00,72,00,65,00,63,00,6f,00,6d,00,6d,00,65,00,6e,00,64,00,65,\ 00,64,00,29,00,00,00 [HKEY_LOCAL_MACHINE\SYSTEM\CurrentControlSet\Control\Power\User\Default\PowerSchemes\381b4222-f694-41f0-9685-ff5bb260df2e\0012ee47-9041-4b5d-9b77-535fba8b1442] [HKEY_LOCAL_MACHINE\SYSTEM\CurrentControlSet\Control\Power\User\Default\PowerSchemes\381b4222-f694-41f0-9685-ff5bb260df2e\0012ee47-9041-4b5d-9b77-535fba8b1442\6738e2c4-e8a5-4a42-b16a-e040e769756e] "ACSettingIndex"=dword:000004b0 "DCSettingIndex"=dword:00000258 [HKEY_LOCAL_MACHINE\SYSTEM\CurrentControlSet\Control\Power\User\Default\PowerSchemes\381b4222-f694-41f0-9685-ff5bb260df2e\0d7dbae2-4294-402a-ba8e-26777e8488cd] [HKEY_LOCAL_MACHINE\SYSTEM\CurrentControlSet\Control\Power\User\Default\PowerSchemes\381b4222-f694-41f0-9685-ff5bb260df2e\0d7dbae2-4294-402a-ba8e-26777e8488cd\309dce9b-bef4-4119-9921-a851fb12f0f4] "ACSettingIndex"=dword:00000000 "DCSettingIndex"=dword:00000001 [HKEY_LOCAL_MACHINE\SYSTEM\CurrentControlSet\Control\Power\User\Default\PowerSchemes\381b4222-f694-41f0-9685-ff5bb260df2e\0e796bdb-100d-47d6-a2d5-f7d2daa51f51] "ACSettingIndex"=dword:00000000 "DCSettingIndex"=dword:00000000 [HKEY_LOCAL_MACHINE\SYSTEM\CurrentControlSet\Control\Power\User\Default\PowerSchemes\381b4222-f694-41f0-9685-ff5bb260df2e\19cbb8fa-5279-450e-9fac-8a3d5fedd0c1] [HKEY_LOCAL_MACHINE\SYSTEM\CurrentControlSet\Control\Power\User\Default\PowerSchemes\381b4222-f694-41f0-9685-ff5bb260df2e\19cbb8fa-5279-450e-9fac-8a3d5fedd0c1\12bbebe6-58d6-4636-95bb-3217ef867c1a] "ACSettingIndex"=hex:00,00,00,00 "DCSettingIndex"=hex:02,00,00,00 [HKEY_LOCAL_MACHINE\SYSTEM\CurrentControlSet\Control\Power\User\Default\PowerSchemes\381b4222-f694-41f0-9685-ff5bb260df2e\238c9fa8-0aad-41ed-83f4-97be242c8f20] [HKEY_LOCAL_MACHINE\SYSTEM\CurrentControlSet\Control\Power\User\Default\PowerSchemes\381b4222-f694-41f0-9685-ff5bb260df2e\238c9fa8-0aad-41ed-83f4-97be242c8f20\29f6c1db-86da-48c5-9fdb-f2b67b1f44da] "ACSettingIndex"=dword:00000708 "DCSettingIndex"=dword:00000384 [HKEY_LOCAL_MACHINE\SYSTEM\CurrentControlSet\Control\Power\User\Default\PowerSchemes\381b4222-f694-41f0-9685-ff5bb260df2e\238c9fa8-0aad-41ed-83f4-97be242c8f20\94ac6d29-73ce-41a6-809f-6363ba21b47e] "ACSettingIndex"=dword:00000000 "DCSettingIndex"=dword:00000000 . . . This is "Example" of how the reg would look like after replacements. Windows Registry Editor Version 5.00 [HKEY_LOCAL_MACHINE\SYSTEM\ControlSet001\Control\Power\User\PowerSchemes\a1841308-3541-4fab-bc81-f71556f20b4a] "Description"=hex(2):40,00,25,00,53,00,79,00,73,00,74,00,65,00,6d,00,52,00,6f,\ 00,6f,00,74,00,25,00,5c,00,73,00,79,00,73,00,74,00,65,00,6d,00,33,00,32,00,\ 5c,00,70,00,6f,00,77,00,72,00,70,00,72,00,6f,00,66,00,2e,00,64,00,6c,00,6c,\ 00,2c,00,2d,00,31,00,30,00,2c,00,53,00,61,00,76,00,65,00,73,00,20,00,65,00,\ 6e,00,65,00,72,00,67,00,79,00,20,00,62,00,79,00,20,00,72,00,65,00,64,00,75,\ 00,63,00,69,00,6e,00,67,00,20,00,79,00,6f,00,75,00,72,00,20,00,63,00,6f,00,\ 6d,00,70,00,75,00,74,00,65,00,72,00,20,00,70,00,65,00,72,00,66,00,6f,00,72,\ 00,6d,00,61,00,6e,00,63,00,65,00,20,00,77,00,68,00,65,00,72,00,65,00,20,00,\ 70,00,6f,00,73,00,73,00,69,00,62,00,6c,00,65,00,2e,00,00,00 "FriendlyName"=hex(2):40,00,25,00,53,00,79,00,73,00,74,00,65,00,6d,00,52,00,6f,\ 00,6f,00,74,00,25,00,5c,00,73,00,79,00,73,00,74,00,65,00,6d,00,33,00,32,00,\ 5c,00,70,00,6f,00,77,00,72,00,70,00,72,00,6f,00,66,00,2e,00,64,00,6c,00,6c,\ 00,2c,00,2d,00,31,00,31,00,2c,00,50,00,6f,00,77,00,65,00,72,00,20,00,53,00,\ 61,00,76,00,65,00,72,00,00,00 [HKEY_LOCAL_MACHINE\SYSTEM\ControlSet001\Control\Power\User\PowerSchemes\a1841308-3541-4fab-bc81-f71556f20b4a\0012ee47-9041-4b5d-9b77-535fba8b1442] [HKEY_LOCAL_MACHINE\SYSTEM\ControlSet001\Control\Power\User\PowerSchemes\a1841308-3541-4fab-bc81-f71556f20b4a\0012ee47-9041-4b5d-9b77-535fba8b1442\6738e2c4-e8a5-4a42-b16a-e040e769756e] "ACSettingIndex"=dword:000004b0 "DCSettingIndex"=dword:0000012c [HKEY_LOCAL_MACHINE\SYSTEM\ControlSet001\Control\Power\User\PowerSchemes\a1841308-3541-4fab-bc81-f71556f20b4a\0d7dbae2-4294-402a-ba8e-26777e8488cd] [HKEY_LOCAL_MACHINE\SYSTEM\ControlSet001\Control\Power\User\PowerSchemes\a1841308-3541-4fab-bc81-f71556f20b4a\0d7dbae2-4294-402a-ba8e-26777e8488cd\309dce9b-bef4-4119-9921-a851fb12f0f4] "ACSettingIndex"=dword:00000000 "DCSettingIndex"=dword:00000001 [HKEY_LOCAL_MACHINE\SYSTEM\ControlSet001\Control\Power\User\PowerSchemes\a1841308-3541-4fab-bc81-f71556f20b4a\0e796bdb-100d-47d6-a2d5-f7d2daa51f51] "ACSettingIndex"=dword:00000000 "DCSettingIndex"=dword:00000000 [HKEY_LOCAL_MACHINE\SYSTEM\ControlSet001\Control\Power\User\PowerSchemes\a1841308-3541-4fab-bc81-f71556f20b4a\19cbb8fa-5279-450e-9fac-8a3d5fedd0c1] [HKEY_LOCAL_MACHINE\SYSTEM\ControlSet001\Control\Power\User\PowerSchemes\a1841308-3541-4fab-bc81-f71556f20b4a\19cbb8fa-5279-450e-9fac-8a3d5fedd0c1\12bbebe6-58d6-4636-95bb-3217ef867c1a] "ACSettingIndex"=hex:00,00,00,00 "DCSettingIndex"=hex:03,00,00,00 . . .
You might have to change the permissions of the keys, if you get a Permission Denied to write in "PowerSchemes". Right click the key and click permissions and then give full access for you or the administrator. Thanks Buddy! It realy works and solve my problem in restoring Balance Power option in my HP Notebook! Please keep looking acute! Thank you ! It works and solve my problem . My Sony vaio laptop High performance power plan was missing . Good Luck !